Hungry for something light and airy but most importantly healthy? These white rolls are as soft as pillows. Delicious with chicken and spices – dream away. 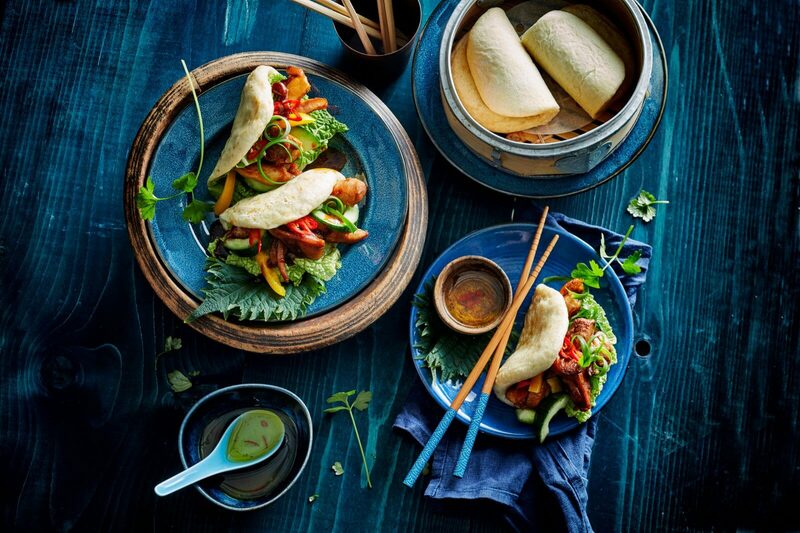 Make the steamed buns first: simply roll out the buns on your kitchen counter with some flour. They should look like flat circles. Make baking paper squares of about 10×10 cm. Fold the rolled buns once with a piece of baking paper in the middle. They should look like semi-circles. Steam the buns over boiling water for 15 minutes in a steam bath. In the meantime cut the chicken breast into small pieces, and start baking the chicken. In the last 5 minutes add the pepper and sambal. Cut the cucumber into thin slices, the red peppers in strips and the scallions in thin rings. Tear off the leaves of the gem lettuce. Remove the buns from the basket and bake with lettuce, cucumber, paprika, bush and finally the chicken. Serve the buns with hot sauce or chilli oil.